State Wall Maps from Omnimap. A thumbnail image of the North Carolina state wall map without individually colored counties. 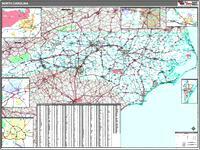 Sample detail from the North Carolina state wall map without individually colored counties. A thumbnail image of the Oklahoma state wall map with individually colored counties. Sample detail from the Oklahoma state wall map with individually colored counties. a) The name of the state. c) Whether or not you want zip code boundaries on the map. d) Any framing or mounting option, if necessary. e) Any frame color option, if necessary. Magnetic mount - thin aluminum frame. 3/4" brushed aluminum frame, available on either pin-board mount or magnetic mount. Magnetic mount - 4" rushed aluminum frame. 4" wide brushed aluminum frame.